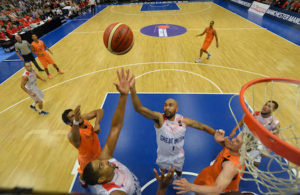 Great Britain, led by 17 points from Nate Reinking, moved to 5-0 in their Eurobasket qualifying campaign with a less than emphatic 66-64 victory over Hungary at the National Indoor Arena. 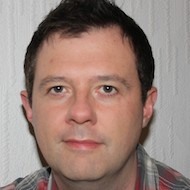 But even if the performances of Chris Finch’s men this summer have been far from perfect, their record is exactly that. The only unbeaten side in all of Europe, a further win in Macedonia next Tuesday would be enough to clinch a place in Lithuania 2011. Now, as a matter of ambition, the challenge must be to go eight for eight but they will need to do better than this after blowing an 18-point lead before escaping at the last. 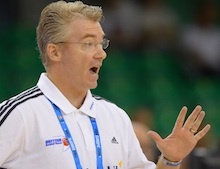 GB made life difficult for themselves with poor shooting and ineffective play from their point guards. Finch, unimpressed with the showing, admitted it could have all been so different and assumed some of the responsibility. Drew Sullivan surprisingly started in place of Dan Clark but the hosts picked up where they left off, four days earlier, against Bosnia. Running, gunning, their athleticism and pace were initially too much for a Hungarian side that failed to put up the same challenge they produced on home soil, in Szolnok, two weeks before. With 4.30 gone, GB showed the best of their ball movement, a rebound from Ogo Adegboye spun around the key until Reinking was open for a three which he duly drained to open up a 12-4 lead and force the visitors into a time-out. The young playmaker from St. Bonaventure improves and impresses with every game. He drove hard but threaded to Reinking for another long-range effort and suddenly Finch had the early momentum he had called for. And then, Eric Boateng took just six seconds to justify his earliest appearance in a qualifier with a hook shot that helped secure a 19-11 cushion at the end of the first period. Heading into the tie, all the talk had been of the need to limit the Hungarians hopes at the outset. That mission accomplished, Finch’s men looked set to seize control. Adegboye ignited a 7-0 start and in an impressive spell, Clark opened his account with 2.59 to go in the period to extend the advantage to 34-16. 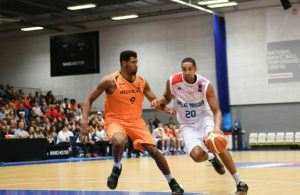 The guests made an effort to eat into the lead but by the interval, Britain’s advantage stood at 37-22. Like a prize fighter, they had their opponent on the ropes. It just needed one more heavy blow. Unexpectedly, Hungary tightened their gloves and struck back, hard and fast. A 7-0 run, propelled by Peter Lorant, forced Finch into a time-out to halt the slide. He got the desired response when Clark hit a three-pointer but with 4.51 left in the third, Adegboye was called for an unsportsmanlike foul and Lorant brought his team back to trail 46-38. GB looked rattled, their playmaking became erratic, and their nerves took another tug when Akos Horvath hit from six metres to bring the Hungarians within 5. Flinder Boyd responded in kind. The home crowd exhaled but the drama was far from over. In such circumstances, Luol Deng can normally be unleashed. The Chicago Bulls forward has been given a licence to roam this summer but the scouting reports know his game and the threat he poses. Stifled, smothered, and pressed at every turn, he made only 3 of his first 12 field-goalattempts and again struggled from the line. This was not one of his prime performances on national duty but neither did many of his team-mates cover themselves in glory. 58-47 behind at the start of the fourth, the Hungarians accelerated once more, with 13 answered points that increased the tensions as the gap was sliced to 63-61 with 2.22 left. After being held scoreless for six minutes, Deng made a foul shot but Adam Hanga drained a three for Hungary that improbably levelled matters at 64-64. But Mensah-Bonsu and Deng each hit single foul shots that proved conclusive, with the NBA star producing a priceless block at the other end as GB pulled back from the brink. 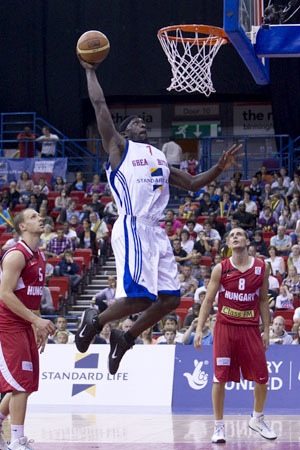 Greater heights will be needed when they meet Macedonia who pummelled Ukraine 71-55. On the brink of glory, it is a job not yet complete. Notes: The attendance is 2174.